Prep asparagus by shaving into thin slices (see video below). Toss with the diced scallions and 1 tablespoon of the olive oil. Asparagus should be well coated with scallions and olive oil. Preheat oven to 500˚ with a pizza stone. Sprinkle cornmeal on a large enough cutting board. Knead/toss/roll out dough to roughly a 14″ circle. Brush with 1 tablespoon of olive oil and sprinkle garlic over the crust. 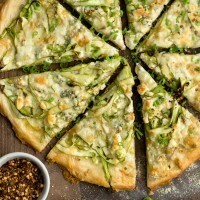 Add the shaved asparagus over the pizza evenly, it’s okay if it’s mounded as it will cook down as the pizza cooks. Sprinkle with the shredded mozzarella and gorgonzola. Carefully transfer the pizza to the stone and bake until the crust is golden and the cheese is bubbling, 10 to 14 minutes (depending on how well your oven keeps heat). Carefully remove the pizza, let cool for 5 minutes, then cut and serve.